Nearly a year ago, I spent a pleasant hour cobbling together an owl box out of scrap lumber and salvaged nails, then another, less pleasant hour trying to fasten the thing into our mesquite tree. This spring, Gila woodpeckers and Gambel quail showed an interest (those quail will nest anywhere, it seems), but the box was empty until today, when I looked up at it–less hope than habit after all these months–to find a tiny gray face staring back at me! 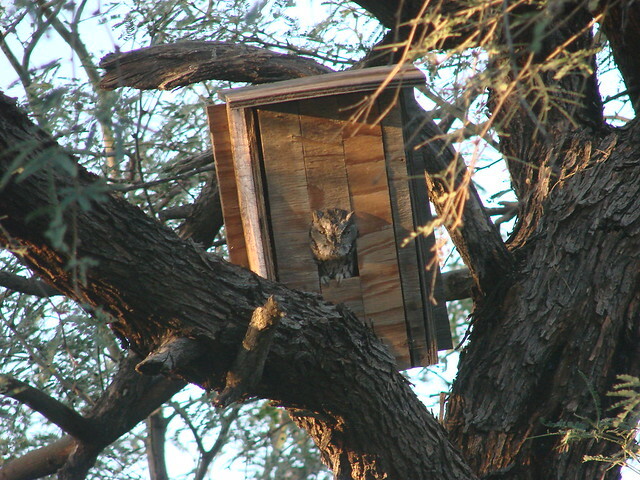 We have a western screech-owl, finally, the first owl ever to occupy any of the clumsily constructed boxes I’ve put up over the years. But now how to keep him in there? I spread some extra seed on the ground under the tree, hoping that perhaps it will draw kangaroo-mice or some other suitably tasty morsel for his dining pleasure.